OBJECTIVE: To examine the impact that domestic violence (DV) has on hindering the success of urban migrants in Peru and any association with maternal depression, impaired parenting, social capital, and child development. METHODS: This was a cross-sectional study consisting of structured interviews with 97 mothers and their school-aged children in El Porvenir, a predominantly migrant area of the city of Trujillo, Peru. Data collection occurred in February-June 2011. Proven tools previously validated for use in Spanish were used to assess the following variables: maternal depression, social capital, domestic violence, parenting behaviors, child socioemotional development, and child cognitive development. Correlational, multiple regression, tests of interaction, and indirect/mediator models were used for analysis. RESULTS: Sixty-five percent of women reported currently experiencing DV. DV strongly predicted depression (P < 0.001). Women who reported DV were less likely to be employed (P < 0.05), had lower cognitive social capital (P < 0.01), engaged in fewer caregiving activities (P < 0.05), had less maternal energy (P < 0.05), and were less warm (P < 0.05). DV was associated with internalizing behaviors in children (P < 0.01), with impaired parenting partially mediating this relationship. CONCLUSIONS: DV compromises women's mental health and parenting ability. High rates of DV among urban migrants affect the whole community by hindering employment potential and reducing trust among community members. Interventions targeting DV-related variables (e.g., substance abuse and limited job opportunities for men) could reduce the deleterious effects of DV on urban migrant communities across Latin America. Key words: Women's health; rural-urban migration; domestic violence; violence against women; child development; depression; Peru. OBJETIVO: Analizar la repercusión de la violencia doméstica como obstáculo para el éxito de los migrantes urbanos del Perú, y su asociación con la depresión materna, el deterioro de la crianza, el capital social y el desarrollo infantil. MÉTODOS: Se realizó un estudio transversal que constaba de entrevistas estructuradas dirigidas a 97 madres y sus hijos en edad escolar residentes en El Porvenir, una zona predominantemente migratoria de la ciudad de Trujillo (Perú). Se recopilaron datos de febrero a junio del 2011. Se emplearon instrumentos comprobados, validados anteriormente para su uso en español, con objeto de evaluar las siguientes variables: la depresión materna, el capital social, la violencia doméstica, los comportamientos de crianza, y el desarrollo socioemocional y cognoscitivo de los niños. Para el análisis se utilizaron diseños correlacionales y de regresión múltiple, pruebas de interacción y modelos indirectos o de mediadores. RESULTADOS: El 65% de las mujeres notificaron que eran víctimas de algún tipo de violencia doméstica en aquel momento, y esta predijo intensamente la depresión (P < 0,001). Las mujeres que notificaron violencia doméstica tenían menores probabilidades de tener un empleo (P < 0,05), poseían un capital social cognoscitivo inferior (P < 0,01), realizaban menos actividades de cuidado de otras personas (P < 0,05), tenían menos energía para la crianza (P < 0,05), y eran menos afectuosas (P < 0,05). La violencia doméstica se asoció con comportamientos de internalización en niños (P < 0,01), y el deterioro de la crianza mediaba parcialmente esta relación. CONCLUSIONES: La violencia doméstica compromete la salud mental y la capacidad de crianza de las mujeres. Las tasas elevadas de esta entre los migrantes urbanos afectan a toda la comunidad al entorpecer su potencial para lograr un empleo y reducir la confianza entre los miembros de la comunidad. Las intervenciones que actúen sobre las variables relacionadas con la violencia doméstica (por ejemplo, el consumo de sustancias psicoactivas y las limitadas oportunidades de trabajo para los hombres) podrían reducir los efectos nocivos de la violencia doméstica en las comunidades de migrantes urbanos en América Latina. Palabras clave: Salud de la mujer; migración rural-urbana; violencia doméstica; violencia contra la mujer; desarrollo infantil; depresión; Perú. Poverty is becoming increasingly urbanized across low- and middle-income countries. Families are moving away from their rural places of origin in search of economic and educational opportunities or medical and social services not available in rural communities (1). In Latin America, ongoing civic violence in rural areas and a legacy of targeting indigenous groups has accelerated the push of migrants into cities (2). Despite seeking better living conditions, urban migrant communities face significant risk factors for ongoing poverty, poor physical health, family dissolution, and compromised mental health (3). It has been postulated that one of the factors affecting the psychological well-being of urban migrant communities is domestic violence (used in this article interchangeably with interpersonal violence, or IPV) (4). Rates of DV are higher in low- and middle-income countries in general, and Latin America has the highest rates in the Western Hemisphere (5). Prevalence is especially high in Bolivia (47%), Peru (45%), Colombia (44%), and Nicaragua (30%) (6, 7). Many risk factors for IPV are more prevalent in urban migrant communities, including low education level, cohabitation, previously witnessing/experiencing violence, and limited or fragmented social support networks (8, 9). In addition, there is a strong link between alcohol use and IPV in Latin America, a relationship that may be more salient in urban migrant communities (8). Studies of men living in urban slums in India and Brazil suggest that daily competition for limited work increases frustration and stress, exacerbating alcohol abuse and heightening risk for IPV (3). Further, women often need to work to make ends meet, which skews the power balance in a male hierarchical society. This change in power subsequently makes urban migrant women more susceptible to IPV (10, 11). For urban migrant women with little extended family, low social support, and poor access to social services, domestic violence may result in depression and other mental health concerns. DV in Latin America has been tied to increased cases of depression, anxiety, somatization, post-traumatic stress disorder (PTSD), dissociative symptoms, and sexual dysfunction (12-15). Rates of suicidal ideation and suicidal behavior are 3 times as high in women who have been abused by a partner (16). Domestic violence also appears to have cascading effects on children. Children exposed to IPV in the home are at increased risk for internalizing (e.g., anxiety and depression) and externalizing disorders (e.g., oppositional defiance and ADHD), antisocial behavior in adolescence, posttraumatic stress symptoms, early and unwanted pregnancies, and physical and sexual victimization (17, 18). Though research is limited and variable, IPV may affect child neurocognitive development by suppressing fluid reasoning and other components of cognition (19). Studies conducted within Latin America have found associations between IPV and miscarriage, premature birth, low birth weight, poor nutrition, and child mortality (15). The relationship between IPV and deleterious child outcomes may be mediated by impaired parenting practices among women experiencing IPV. Women with a history of IPV are more likely to use harsh discipline practices (including physical punishment, threats, and intimidation) and engage in child abuse (20). Unfortunately, the majority of research on the link between IPV and parenting and IPV and child outcomes has been conducted in the Western world. No research currently exists on how IPV in urban migrant communities affects parental and child functioning. In addition to impacting women's mental health, parenting behaviors, and child outcomes, IPV among urban migrants in Latin America may affect the community's potential as a whole. These communities often lack cohesive social support networks. Urban migrants come from various parts of the country where different religions, dialects, and political situations have shaped their worldview. They live in densely-populated neighborhoods with high crime rates and little foundation for trust and support. Non-migrants in these communities tend to be some of the poorest in the city and have low social mobilization; limited to shantytowns, they are exposed to a constant influx of migrants with whom they must compete for increasingly fewer jobs and resources (21). It has been theorized that this low social capital is one of the reasons for poor mental health (22); and unfortunately, global health organizations attempting to implement interventions to increase social capital in immigrant, refugee, and migrant communities have had mixed success (23). 1. What is the relationship between IPV and maternal depression in an urban migrant community? 2. How is IPV related to social capital, and does social capital moderate the relationship between IPV and maternal depression? 3. Is IPV associated with impaired parenting in urban migrant women? 4. Is IPV associated with socioemotional and cognitive outcomes of children? 5. Is the relationship between IPV and child outcomes mediated by impaired parenting practices? 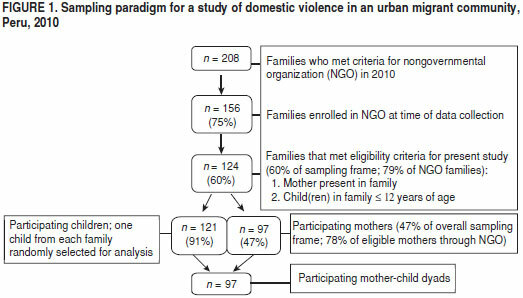 The objective of the present study was to examine how domestic violence hinders the success of urban migrants through its association with maternal depression, impaired parenting, social capital, and child development. By shedding light on the risk and protective factors, this study may elucidate possible areas for intervention, and by clarifying the relationship between IPV and social capital, it may inform future interventions and urban health initiatives. This was a cross-sectional study that included structured interviews and standardized cognitive assessments. Interviews and assessments were conducted over a 5-month period from February-June 2011. Trujillo is the third largest city in Peru, with approximately 590 000 inhabitants. El Porvenir is one of its main migrant communities, with 70% of its residents having relocated. El Porvenir shares many of the sociodemographic characteristics of urban migrant communities across Latin America. Migration to the area began in the 1960s, with economic and ecological crises fueling it in the 1970s, and civic violence, guerilla terrorism, and government seizure of indigenous land escalating migration into the twenty-first century (2). Many of the settlers in El Porvenir have been victims of political terrorism or have suffered from various types of social or economic marginalization, as well as direct physical and psychological abuse (24). These risk factors are akin to other Latin American urban migrant communities (11, 21). Ninety-seven mothers and their school-aged children were recruited for the study from the El Porvenir area of Trujillo, Peru. Data was collected in partnership with an education-based non-governmental organization (NGO) that preferred to remain anonymous. Pairing with the NGO increased the acceptability of participation for mothers and also allowed the researchers a link to social services and basic counseling resources should any psychological distress be detected in participants. Figure 1 outlines the sampling frame and final sample number (97 dyads) for the study. Spanish-versions of all measures were available and had been previously validated with Spanish-speaking populations. Structured interviews were used to collect demographic information (e.g., household size, educational attainment, and relationship, migrant, and job status). Domestic violence. Presence and severity of domestic violence was assessed using the Woman Abuse Screening Tool (WAST) (25), which examines conflict, tension, intimidation, degradation, and physical, verbal, and sexual abuse. The measure has good internal consistency (α = 0.91). Socioeconomic status. Socioeconomic status was assessed using the Progress out of Poverty Index (PPI). The PPI estimates the likelihood that a family would fall below the poverty line using the US$ 1/day/PPP1 and US$ 2/day/PPP international benchmarks. PPI utilizes indicators that are more likely to change over time (such as having a specific household electronic device or the materials of the home), allowing better differentiation between families that would all be considered low-income by other measures. Maternal depression. This was assessed using the 12-item Center for Epidemiological Studies-Depression Scale (CES-D). The Spanish version of the CES-D has strong psychometric properties (26). Parenting practices. Parenting was assessed using self-report items from the Parental Involvement and Acceptance dimensions of the Home Observation of the Environment Scale for Middle Childhood (HOME-SF) (27). The items were previously adapted for use in the Early Childhood Longitudinal Study, Kindergarten Cohort (ECLS-K). From this scale, two factors of parenting behaviors, engagement in caregiving activities and parenting attitudes were derived. Information regarding discipline practices was derived using the Child-Rearing Practices Report (CRPR) (28). Factor analysis on the scale yields four dimensions: warmth, parental energy, authoritative parenting, and authoritarian parenting. Social capital. Social capital was measured using the Short Adapted Social Capital Assessment Tool (SASCAT) (29). The SASCAT yields dimensions of structural, connecting/linking, and cognitive social capital. Structural social capital looks at membership in and support from group membership, as well as individual social support. Connecting/linking social capital asks about participant's involvement in citizenship activities. Cognitive social capital examines trust and belongingness in the community. This measure has been previously utilized and validated in Peru (30). Cognitive development. Cognitive development in children was measured using the "Habilidad Breve Intelectual of the Batería III Woodcock-Muñoz" (Batería III) (31). The brief test was chosen to reduce examiner error and discomfort/fatigue among children. Measures produce scores in three subscale areas: verbal comprehension, fluid reasoning, and processing speed. Child socioemotional development. This was measured using the parent report measures of the Social Skills Improvement System (SSIS) (32). The Problem Behavior Scale was administered, which focuses on internalizing (i.e., anxiety, sadness, low self-esteem) and externalizing symptoms (i.e., impulsivity, aggression, anger). Selected items have good internal consistency (α = 0.84). This study was approved by The Catholic University of America's Institutional Review Board and the director of the NGO and its Family Welfare Department, the coordinator of which is a local community member. Participants were recruited through announcements made at monthly family meetings. Individual meetings were subsequently held with mothers interested in the study; at that time, the voluntary nature of participation and confidentiality were reviewed, and informed consent was obtained. Anonymity was maintained through a coding system only available to the primary investigator. Given the low levels of literacy among mothers and the sensitivity of questions, all measures were administered via structured interviews with visual aids. For their participation, mothers received a bag of food, and children were given a small prize. Mothers who revealed a potentially dangerous DV situation, severe depression, or suicidal ideation were referred to the organization's psychosocial support teams for appropriate interventions. Analyses were conducted using SPSS Statistics software, version 17 (SPSS Inc., an IBM company, Chicago, Illinois, United States). Two significant outliers related to the level of cumulative social capital were removed to correct skew and kurtosis, leaving 95 valid cases for analysis. Structural social capital was also non-normal and was corrected using a square-root transformation. Connecting/linking social capital yielded a highly restricted range; 70% of the sample had a score of 0. This variable was dropped from analysis. Multiple regression analysis was used to test the predictive power of DV on maternal depression while controlling for covariates (migrant status, job status, single motherhood, poverty level, and education level; heretofore referred to as urbanization stress factors). Relationships between DV, parenting practices, and social capital were explored via bivariate correlations. Crossover interaction computations were used to test moderation of DV and depression by social capital. The relationship between DV and child outcomes was explored within the context of the proposed mediation of this relationship by parenting practices. Because the data presented is cross-sectional, it is most accurate to interpret possible mediation relationships as indirect effects rather than mediators. A four-step approach developed by Baron and Kenny for assessing indirect effects through regression analyses was utilized. To calculate the strength of the indirect effect, Sobel's approach of multiplying regression coefficients was used and the ratio of indirect : total was used to determine the amount of variance in the relationship between X and Y explained by M (the mediator) (33). Eighty-four percent of the sample were migrants, the majority of whom came from the Andes area of Peru. Nearly one-third of the population reported being single, nearly two-thirds had jobs, and religious affiliations were diverse. These demographic characteristics are consistent with other urban migrant communities in Latin America (21). Table 1 provides additional demographics for the mothers in the sample. Nearly two-thirds of the sample (65%) reported some type of current DV: 65% reported emotional abuse, 37% physical abuse, and 17% sexual abuse. 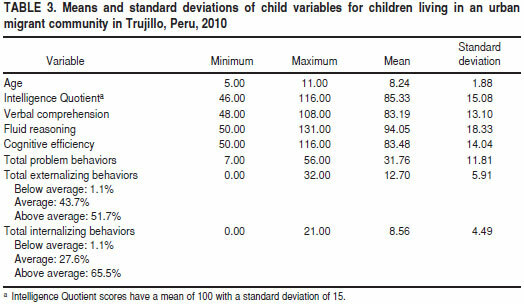 Intercorrelations for maternal variables are provided in Table 2. Job status was weakly negatively correlated with DV (r = -0.27, P < 0.05); women who were employed reported lower DV levels. DV was also negatively correlated with single mother status, with single mothers having lower levels of domestic violence (r = -0.58, P < 0.001). Roughly two-thirds of mothers met criteria for clinical depression (64%). After controlling for factors of urbanization stress, higher levels of DV were associated with higher levels of maternal depression (b = 0.65, t(89) = 5.96, P < 0.001). DV was the only significant predictor of depression, other than single mother status, and explained 42% of the variance in depression scores. A significant relationship was seen between cognitive social capital and DV, such that higher levels of cognitive social capital were associated with lower levels of DV (r = -0.29, P < 0.01). However, cognitive social capital was not a significant moderator of the relationship between depression and DV, and DV was not significantly correlated with structural or cumulative social capital. Descriptive information regarding child outcomes can be found in Table 3. Domestic violence was significantly correlated with a number of parenting practices. Specifically, higher DV was associated with less engagement in caregiving activities, (r = -0.23, P < 0.05), lower warmth (r = -0.22, P < 0.05), and less energy for parenting (r = -0.22, P < 0.05). DV was also significantly correlated with internalizing behavior in children (r = 0.38, P < 0.01). DV was not related to externalizing behaviors or cognitive outcomes for children. Indirect effects were seen between domestic violence and child outcomes (Figures 2A and 2B). Specifically, lower engagement in parenting activities explained 20% of the variance in the relationship between DV and child internalizing behaviors. Lower caregiver warmth explained approximately 15% of the variance between DV and child internalizing behaviors. This study examined how IPV in an urban migrant community relates to maternal mental health, parenting, and subsequent child outcomes. As expected, rates of IPV were high in this community. Nearly two-thirds of women reported experiencing some kind of IPV, a rate higher than any known previous study conducted in Latin America. Increased overall violence in urban communities combined with low police presence, high access to alcohol, and social marginalization of migrants likely creates an environment where IPV is distressingly commonplace. The rate of IPV in this community is especially high given that mothers were only asked about present DV rather than lifetime occurrence. It is likely that many of the other women in the sample had suffered DV in the past; in fact, a number of women spontaneously disclosed this in the context of their interviews, with "ya no" (not anymore) being a common response when asked about IPV. Future studies should investigate differences between women with a history of IPV and those with ongoing IPV in an attempt to identify protective factors related to escaping situations of IPV. Unexpectedly, women in this study who reported having a job had lower levels of IPV. This is inconsistent with previous studies conducted in Latin America, which theorize that employment increases a woman's status within a domestic partnership, thus threatening the male hierarchy and leading to increased IPV (8, 11, 19). The mechanism by which employment in this community relates to lower IPV is unclear; thus, future studies with urban migrants are needed. Consistent with previous literature, DV was a significant predictor of depression in urban migrant women. In 1999, Perilla identified the strict gender roles and hierarchies typical of traditional Latin societies as contributing to Latina women feeling greater helplessness, functional impairment, and concomitant depression than non-Latina women who were also victims of IPV (34). The lack of social capital in urban migrant communities affects their ability to access psychosocial services that might ameliorate depression. Further exacerbating the problem is the scarcity of mental health services in many Latin American communities; less than 2% of government health budgets go to mental health, and little of this is channeled to IPV services (35). The combination of limited social and institutional support makes women less likely to leave their abusers. Akin to models of learned helplessness, this inability to escape violent and degrading situations likely contributes to high rates of depression (36). The present study found a significant relationship between higher levels of cognitive social capital and lower levels of IPV. Thus, mothers who feel connected to and trusting of their community may have more social support to escape or avoid abusive situations (37). However, the relationship might also go in the opposite direction. Individuals with ongoing domestic violence may be less likely to engage with their community due to shame or fear of intensifying partner abuse. Ultimately, there is likely a dual reinforcing pathway, but longitudinal and linear modeling studies are needed to explicate this relationship. Previous studies have suggested strong links between depression and impaired parenting, and have postulated that impaired parenting is a key mediator of the relationship between depression and child outcomes. However, this relationship has been examined infrequently for DV. In this study, IPV was associated with greater levels of internalizing problems in children, less parental warmth, lower engagement in caregiving activities, and reduced energy for parenting. Latina women are embedded in a culture that places the utmost emphasis on the mother/child relationship; thus, having a low level of warmth is rare and significant (38). Furthering support for a unique effect of domestic violence, Latina women who experience DV report less attachment to their children and more isolation than non-Latina mothers who experience DV (39). Of note, impaired parenting associated with IPV helped explain its relationship with internalizing behavior in children. This is important since it suggests that interventions that target parenting may ameliorate the negative cascade effects that IPV can have on child development. Further, interventions that improve mother-child interactions are mutually beneficial for depressed mothers; these interventions reduce the deleterious behavioral effects of maternal depression on children and improve depressive symptomatology through increased self-efficacy and improved ability to gain pleasure from interactions with the child (40). Given the high rates of depression in urban migrant women, parenting interventions may be among the most feasible and may have widespread benefit. A limitation of this study may be its cross-sectional design, which precludes the ability to draw conclusions about directionality of significant relationships. To correct this limitation, future studies should utilize an accelerated multigroup cohort design that includes pregnant women, new mothers, and mothers with children of various ages within this community. Such a design would better capture phenomena over time while reducing the duration of required follow-up. In addition, it would be useful to compare rates of IPV in "sending" communities (i.e., communities of origin) with the rates found within urban migrant communities to determine whether IPV prevalence increases as women become more urbanized, or if its consequences simply become more salient. The exclusion of fathers is also a limitation; in order to fully comprehend the high rates of IPV among urban migrants, it is crucial to understand what increases the risk of being an offender. As engaging men in psychosocial research is difficult in transient communities, unique research paradigms are needed to reach this population. In addition, while all assessments were selected based on availability in Spanish and demonstrated validity among Spanish-speaking populations, additional measures used in conjunction may have been helpful in increasing the clinical utility of findings. For example, the CES-D Depression Scale (26) has strong psychometric properties, but does not include a scale related to functional impairment. The ability to align CES-D scores with functional impairment scores would improve the content validity of the measure, and would also help decide who needs rapid access to mental health services. Given low access to psychological services in many communities in Latin America, measures of functional impairment that align with a public health or tiered interventions model would be useful for future studies. Urban migrant communities in Peru appear to have high rates of IPV, and IPV appears tied to functional impairment in urban migrant women. These women frequently suffer from depressive symptomatology, compromising their ability to carry out parenting behaviors crucial to the socioemotional development of the child. Being employed and having adequate cognitive social capital may be protective against IPV, as seen in this Peruvian sample, but further research into these areas is needed. Mixed-methodology research, especially studies involving fathers, is warranted. Historically, migrant communities have inadequate access to social services, thus interventions aiming to reduce alcohol use in male partners, provide better emotional and instrumental support for mothers, increase trust and cohesion in community members, and increase parenting knowledge and skills are apropos. These interventions can be delivered by paraprofessionals and integrated into existing community health paradigms. Further studies are needed to determine the generalization of findings from this Peruvian community to urban migrant communities across Latin America. Acknowledgements. The authors express sincere gratitude to the NGO, and specifically the director and coordinator of Family Welfare unit of the NGO, for allowing us to pair with their organization in order to learn more about the lives of urban migrant women in Trujillo. The first author (BK Kohrt) would also like to thank her dissertation committee, Sandra Barrueco, Brendan Rich, and Marcie Goeke-Morey, for guidance and assistance in completing this project. Acknowledgements also include Tess Miller, Ámbar García, and Silvia Rodríguez, who acted as research assistants for the study. Sincere thanks are expressed to the mothers who participated in this project; their strength and "ganas de seguir adelante" are inspirational. Funding. No external funding was received to complete this project, though the first author received the Beryl Anderson Dissertation Award from her home institution at The Catholic University of America to cover the cost of study instruments. 1. Cerrutti M, Bertoncello R. Urbanization and internal migration patterns in Latin America. Buenos Aires: Centro de Estudios de Población Argentina; 2003. 2. Naranjo Morales AG. The Peruvian migration phenomenon. Lima: Centro de Asesoria Laboral del Peru; 2007. 3. Montgomery MR. United Nations Expert Group Meeting on Population Distribution, Urbanization, Internal Migration, and Development. New York: United Nations; 2008. Available from: www.un.org/esa/population/meetings/EGM_PopDist/P11_Montgomery.pdf Accessed on 25 March 2015. 4. Herrman H, Saxena S, Moodie R. Promoting mental health: concepts, emerging evidence, practice: a report of the World Health Organization, Department of Mental Health and Substance Abuse in collaboration with the Victorian Health Promotion Foundation and the University of Melbourne. Geneva: World Health Organization; 2005. 5. World Health Organization. Global and regional estimates of violence against women: prevalence and health effects of intimate partner violence and non-partner sexual violence. Geneva: WHO; 2013. 6. Kishor S, Johnson K. Profiling domestic violence: a multi-country study. Calverton, Maryland, ORC Macro, MEASURE DHS+; June 2004. Available from: www.popline.org/node/235024 Accessed on 4 March 2015. 7. Meekers D, Pallin SC, Hutchinson P. Intimate partner violence and mental health in Bolivia. BMC Women's Health. 2013;13(1):28. 8. Abramsky T, Watts CH, Garcia-Moreno C, Devries K, Kiss L, Ellsberg M, et al. What factors are associated with recent intimate partner violence? Findings from the WHO multi-country study on women's health and domestic violence. BMC Public Health. 2011;11(1):109. 9. Flake DF. Individual, family, and community risk markers for domestic violence in Peru. Violence Against Women. 2005;11(3):353-73. 10. Flake DF, Forste R. Fighting families: family characteristics associated with domestic violence in five Latin American countries. J Fam Violence. 2006;21(1):19-29. 11. Ruel MT. Urbanization in Latin America: Constraints and opportunities for child feeding and care. Food Nutr Bul. 2000;21(1):13. 12. Lund C, Breen A, Flisher AJ, Kakuma R, Corrigall J, Joska JA, et al. Poverty and common mental disorders in low and middle income countries: A systematic review. Soc Sci Med. 2010;71(3):517-28. 13. Meekers D, Pallin SC, Hutchinson P. Prevalence and correlates of physical, psychological, and sexual intimate partner violence in Bolivia. Glob Public Health. 2013;8(5):588-606. 14. Ceballo R, Ramirez C, Castillo M, Caballero GA, Lozoff B. Domestic violence and women's mental health in Chile. Psychol Women Q. 2004;28(4):298-308. 15. Ferri CP, Mitsuhiro SS, Barros MCM, Chalem E, Guinsburg R, Patel V, et al. The impact of maternal experience of violence and common mental disorders on neonatal outcomes: a survey of adolescent mothers in Sao Paulo, Brazil. BMC Public Health. 2007;7(1):209. 16. Ellsberg M, Jansen HAFM, Heise L, Watts CH, Garcia-Moreno C. Intimate partner violence and women's physical and mental health in the WHO multi-country study on women's health and domestic violence: an observational study. Lancet. 2008;371(9619):1165-72. 17. Holt S, Buckley H, Whelan S. The impact of exposure to domestic violence on children and young people: A review of the literature. Child Abuse Negl. 2008;32(8):797-810. 18. Sousa C, Herrenkohl TI, Moylan CA, Tajima EA, Klika JB, Herrenkohl RC, et al. Longitudinal study on the effects of child abuse and children's exposure to domestic violence, parent-child attachments, and antisocial behavior in adolescence. J Interpers Violence. 2011;26(1):111-36. 19. Koenen KC, Moffitt TE, Caspi A, Taylor A, Purcell S. Domestic violence is associated with environmental suppression of IQ in young children. Dev Psychopathol. 2003;15(02):297-311. 20. Calderón V, Gáfaro M, Ibáñez AM. Desplazamiento forzoso, participación laboral femenina y poder de negociación en el hogar:¿empodera el conflicto a las mujeres? Bogotá: Universidad de los Andes; 2011. 21. Montgomery MR. The urban transformation of the developing world. Science. 2008;319(5864):761-4. 22. Henderson S, Whiteford H. Social capital and mental health. Lancet. 2003;362(9383):505-6. 23. Michael YL, Farquhar SA, Wiggins N, Green MK. Findings from a community-based participatory prevention research intervention designed to increase social capital in Latino and African American communities. J Immigr Minor Health. 2008;10(3):281-9. 24. Supporting Kids in Peru (SKIP). Where we work, Trujillo 2005-2009. Available from: www.skipperu.org/about-skip/. Accessed on 11 October 2009. 25. Fogarty CT, Brown JB. Screening for abuse in Spanish-speaking women. J Am Board Fam Med. 2002;15(2):101-11. 26. Grzywacz JG, Hovey JD, Seligman LD, Arcury TA, Quandt SA. Evaluating short-form versions of the CES-D for measuring depressive symptoms among immigrants from Mexico. Hisp J Behav Sci. 2006;28(3):404. 27. Bradley RH, Caldwell BM, Rock SL, Hamrick HM, Harris P. Home observation for measurement of the environment: Development of a home inventory for use with families having children 6 to 10 years old. Contemp Educ Psychol. 1988;13(1):58-71. 28. Block JH, Block J, Morrison A. Parental agreement-disagreement on child-rearing orientations and gender-related personality correlates in children. Child Dev. 1981:965-74. 29. Harpham T, Grant E, Rodriguez C. Mental health and social capital in Cali, Colombia. Soc Sci Med. 2004;58(11):2267-78. 30. De Silva MJ, Harpham T, Tuan T, Bartolini R, Penny ME, Huttly SR. Psychometric and cognitive validation of a social capital measurement tool in Peru and Vietnam. Soc Sci Med. 2006;62(4):941-53. 31. Muñoz-Sandoval AF, Woodcock RW, McGrew KS, Mather N, Ardoino G. Batería III Woodcock-Muñoz. Ciencias Psicológicas. 2009;3(2):245-6. 32. Gresham F, Elliott SN. Social skills improvement system (SSIS) rating scales. Bloomington, MN: Pearson Assessments; 2008. 33. Maxwell SE, Cole DA. Bias in cross-sectional analyses of longitudinal mediation. Psychol Methods. 2007;12(1):23. 34. Perilla JL. Domestic violence as a human rights issue: The case of immigrant Latinos. Hisp J Behav Sci. 1999;21(2):107-33. 35. Alarcon RD, Aguilar-Gaxiola SA. Mental health policy developments in Latin America. Bull World Health Organ. 2000;78(4):483-90. 36. Bargai N, Ben-Shakhar G, Shalev AY. Posttraumatic stress disorder and depression in battered women: The mediating role of learned helplessness. J Fam Violence. 2007;22(5):267-75. 37. Zolotor AJ, Runyan DK. Social capital, family violence, and neglect. Pediatrics. 2006;117(6):e1124. 38. Bornstein MH, Britto PR, Nonoyama-Tarumi Y, Ota Y, Petrovic O, Putnick DL. Child development in developing countries: Introduction and methods. Child Dev. 2012;83(1):16-31. 39. Edelson MG, Hokoda A, Ramos-Lira L. Differences in effects of domestic violence between Latina and non-Latina women. J Fam Violence. 2007;22(1):1-10. 40. Wachs TD, Black MM, Engle PL. Maternal depression: A global threat to children's health, development, and behavior and to human rights. Child Dev Perspect 2009;3(1):9.